Well we had a great time on the shoot for Naturewatch and what a lovely trio of beauties I had to work on - not that any of them need any make up - their au naturel beauty is great and they are all ladies who could easily leave the house with bare skin. But every woman has her insecurities and even just one item of make-up is often the way to believe you can actually go out in public... my personal crux is mascara... I won’t even do the school run without it! We were sent some great cruelty-free products to use, and I would like to say a huge THANK YOU to all those companies that contributed. 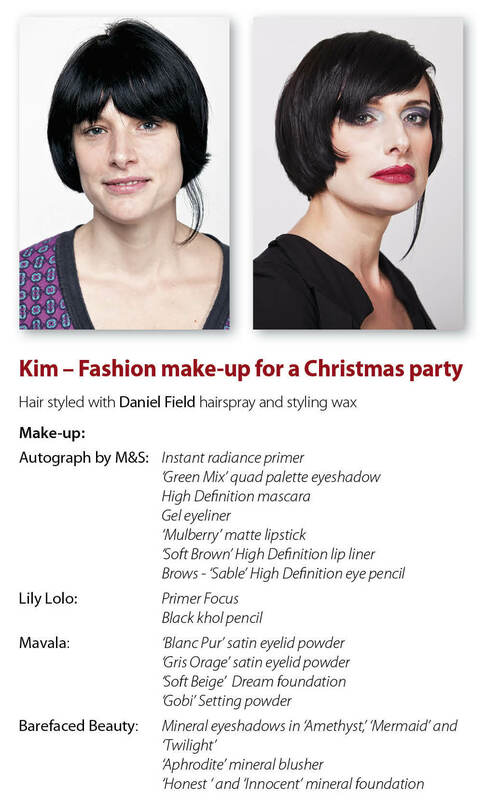 So we created three looks: 2 for everyday make up, and one for a more glitzy party night, a la Christmas! 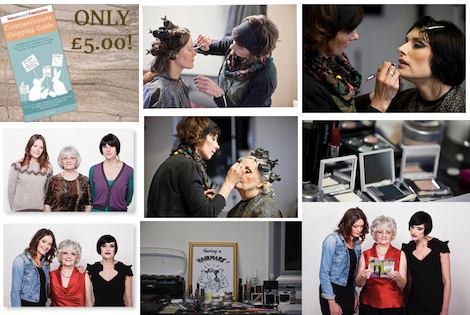 We have make-up for a mature lady - classic, smart and stylish. Make-up for an everyday natural sun kissed look and finally going full-on with our fashion / party make up. In each make-up I have listed the products I used and next to each product I have given a star rating out of 5, based on comparing the quality with items I would normally use in my professional kit on photo-shoots. This means I am considering intensity of pigment, ease of application, finish on the skin, staying power, coverage etc... If anyone has any specific question about products you can email me (email address at the end of this blog) for a more detailed opinion. I will mention my 5 favourite products from the shoot at the end too... products that I am happily keeping in my pro kit and using regularly in my work. For this healthy daytime / natural look, I applied Daniel Field Super-Naturals volumising Air-o-Foam (mousse!) to dry hair and set in heated rollers. For the make-up I applied Autograph by M&S Instant radiance primer to the whole face, followed by Lily Lolo Primer Focus on the eyelids - this is great for keeping your eye-make up on all day (or night) without creasing, and the matte lemon and peach duo tones also act as a brightener for tired eyelids. I then applied Mavala Dream foundation in ‘soft beige’ and Barefaced Beauty Mineral Foundations in ‘Angelic’ and ‘Innocent’ (with foundation brush and flat top kabuki brush (all synthetic), applying the different shades where needed in a contouring and shading technique. On Marie’s eyes I used some lovely Autumnal neutrals - an eyeshadow duo by Lily Lolo in ‘Cappucino’ and a gorgeous mineral eyeshadow loose powder by Barefaced Beauty in ‘ Tiger Eye’ - a sort of coppery gold, and to enhance the eyeline, a slick of liquid eyeliner in brown by M & S Limited Collection. To finish the eyes, a khol eyeliner by Autograph in a kind of deep olive shade, softly blended out with some of the Tiger Eye mineral powder, and then HD Mascara by M&S Limited collection and defined brows with Lily Lolo ‘Sable’ liner and matte cappucino powder from the duo using an angled flat brush. On the lips I chose the M&S Autograph lipstick in ‘Natural’ shade, with its cool and addictive click-open mechanism - very satisfying! The whole look was set with loose powder by Mavala. I dressed out the hair into loose waves and spritzed with Daniel Field Anti Frizz hairspray. 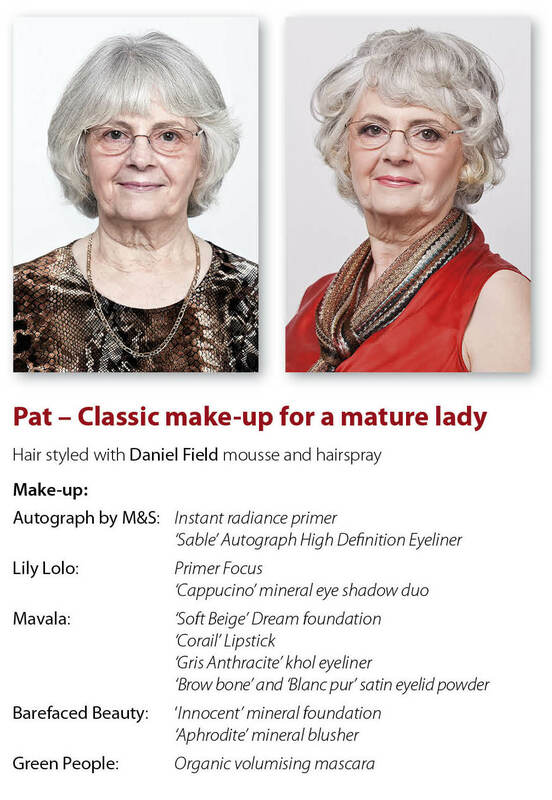 For Pat’s classic, timeless look suitable for a more mature lady, I applied Daniel Field Super-Naturals volumising Air-o-Foam to dry hair and set her hair in rollers. For Pat’s make up I applied Autograph by M&S Instant radiance primer to the whole face, followed by Lily Lolo Primer Focus on the eyelids. The Mavala Dream foundation in ‘soft beige’ was a perfect shade and consistency for Pat’s skin, and I just used a touch of Mineral Foundation in ‘Innocent’ by Barefaced Beauty, where necessary. For Pat’s eyes I used the Lily Lolo cappucino shadow duo but I also enhanced the under-brow bone area with a touch of ‘Blanc Pur 01’ eye shadow by Mavala to ‘lift’ the eye area, combined with some eyebrow enhancing using a brown ‘sable’ shade of eye pencil by Lily Lolo and the cappucino powder from the duo, as before. Under the eyes I defined the lower lid with ‘ Gris Anthracite’ khol pencil by Mavala. A slick of Organic Volumising Mascara by Green People and you can see the difference in Pat’s look already. To give her a healthy glow and enhance her cheekbones I used Mineral blusher in Aphrodite as before, and the look was completed with a perfect lipstick shade to compliment her outfit - Corail 501 by Mavala. To set and finish the make-up I use English Rose Finishing Powder by Barefaced Beauty. I started with Kim’s make-up first, using the same Autograph by M&S Instant radiance primer and Lily Lolo Primer Focus on the eyes. As Kim’s look was much more dramatic and I was going to be using darker colours on the eyes, I dotted some Mavala powder under the eyes and began this area of the make-up before the foundation. On Kim’s eyes I used the colours from the Autograph at M&S eye shadow ‘baked greens’ quad palette, creating a smoky eye, but with a defined rather than blended contour using Mavala’s ‘Gris Orage’ 04 shade for a dramatic evening look. Under the eyes I used a Mavala black khol pencil and smoked it out with some Mineral eye shadows in ‘Amethyst,’ ‘Mermaid’ and ‘Twilight’ from Barefaced Beauty. These colours really co-ordinated with Kim’s eye colour and the shape I created for the eye make-up was meant to compliment the structural shapes in her fabulous dress. I then used the gel eyeliner from M & S (which was brown but I mixed it with some of the dark eye shadows to create a really dark concoction to use as eyeliner, and further enhanced the eyes with HD Volumising mascara (M&S) and the brows using the same sable eye pencil as on the other two models, but a darker shade of powder with my angled brush. I used another shade ‘Gobi’ as a setting powder, and then applied the lipstick - HD lip liner in ‘soft brown’ M&S Autograph, followed by their Matte Mulberry lipstick - perfect shade for the Christmas party season! Whilst championing these fantastic cruelty free products and searching for other cruelty free brands to review and use in my kit, I have realised that a lot of them are not so easily available, so how is the average high street shopper going to know about them, if they don’t have a Compassionate Shopping Guide... even if they did have the guide, only a few of the cosmetic products listed are available in high street shops. Most people know about Lush, but this seems like the only one that is really promoting their ethics as well as marketing their products in a fun and funky way, which appeals to all age groups. They have created a brand that is proud to be Cruelty Free, and their packaging is funky and distinctive, whilst at the same time being very environmentally friendly. Brands like M & S are leading the way by expanding their beauty departments, and including high quality, smartly packaged, highly pigmented and long lasting ranges that any MUA would feel happy to use in her kit. But they need to be loud and proud about their Cruelty Free ethics so that customers can spread the word and know they are buying safe products. If there were at least ten more high quality cosmetic brands from the Compassionate Shopping Guide that were easily accessible and promoted in main high street shops like Boots, Superdrug, Debenhams, House of Fraser, Selfridges etc., it would be much easier for shoppers to make the change without ANY fear of smokescreens or uncertainty. It is really wrong of some brands who are using the Leaping Bunny logo, but are blatantly owned by parent ‘animal testing’ companies. Most average shoppers will not be aware of this, so really, the small brands are misleading their customers and lying about their Cruelty Free status, and consumers are unwittingly funding animal tests, when they thought they were buying ethically - shame on those brands! Some proper cruelty free brands (such as those in the Compassionate Shopping Guide lists) are only available online or in specialist stores, such as health food shops. Well, that’s great for people who shop at health food stores, but not if the brands want to expand their market to everyone and spread the word. I have to admit, even as a vegetarian, I have been reluctant to try certain brands of cosmetics from a local health food store because the packaging is boring, it doesn’t shout out ‘quality product inside!’ and it is sold in a shop that doesn’t allow any kind of joy in its deserts! # grey coloured tofu cheese cake sweetened with jam - YUK!! But I browse round Debenhams in my efforts to stay out of the rain, and look at all the sparkly gifts and the snazzy way that the brands are marketing themselves for Christmas and think if only there was some make up I could buy in there... if only... well, there used to be until Urban Decay was bought by L’Oreal grrrrrr!! I just hope that as this campaign grows, more consumers will become more aware and vote with their purse by shopping with the right cosmetic brands, and spread the word that a world without animal testing is not too far away... but I also hope that more good brands will become readily available on the high street, because it is reeeeally difficult to find the right shade by looking at a computer screen, in the same way that it’s impossible to try on shoes over the internet! 1. 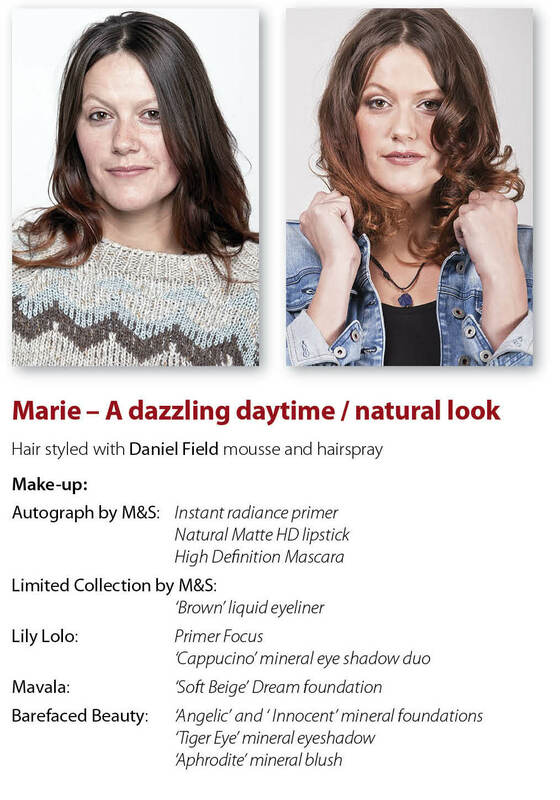 Daniel Field Hair Products - used on all models to set and finish the hair and as you can see the results are great! 2. Mavala Dream Foundation - This is a lovely consistency and flawless finish, not ‘drying’ at all, which is the problem I’ve been having with a current pro brand I’ve been using. Would love 2 or 3 shades for my kit as it would be great for bridal work. 3. Mavala Lipsticks - again, fantastic application, consistency and finish (my favourite shade was Hibiscus... I dint actually use it on anyone on this shoot but it is gorgeous for vintage / bridal lips! 4. The Barefaced Beauty Mineral Eye shadows in those lovely Autumnal shades - Tiger eye and Smokey Taupe are two that I’ve been using since on people - very nice! and so easy to blend - tip - use cosmetic buds rather than a brush.